PhD researcher Dr Clemens Rumpf has developed a software (named ARMOR) that can predict the impact locations of asteroids and their impact effects. Here he discusses Asteroid Day and how ARMOR can help disaster planning against asteroid impact. Today (30 June) is Asteroid Day and this initiative aims to inform the public and raise awareness about the possibility that asteroids can collide with the Earth in the future. The specific date was chosen because in 1908, on the same day, a 30-metre sized object entered the atmosphere over a forest region in Siberia and exploded in mid-air. The resulting shock wave and heat levelled the forest over an area larger than Greater London. In fact, about twice a year, an asteroid causes an explosion in the atmosphere that releases the energy equivalent to the Hiroshima bomb. What’s more, everybody can see asteroid hits first hand when one looks up into the night sky and happens to see a shooting star that leaves its bright streak against the starry background. A shooting star is typically only a grain sized particle that burn up in the atmosphere but it is the same mechanism as a larger scale asteroid collision, only with less consequences. Asteroids are part of our natural environment and we have lived with them as long as we have existed. Even though there is a regular influx of cosmic material onto the Earth, an asteroid impact only rarely causes damage. Usually, asteroids are too small, explode too high or enter the atmosphere over uninhabited territory, such as the oceans that cover 70 per cent of the Earth’s surface. However, in time intervals that can be measured in tens or even hundreds of years, an asteroid impact causes significant damage. A relatively small impact event occurred over the Russian city of Chelyabinsk in 2013. Here, a 17 metre-sized object caused a shock wave that shattered windows and glass shards injured about 1500 people. Impacting asteroids can measure hundreds of metres in diameter and have the potential to cause significant damage to our civilisation. Such an event may lie many years in the future but the potential damage that could be caused is reason enough to research asteroids and learn about their potential for natural disaster. In contrast to other natural disasters, such as earthquakes, an asteroid impact is predictable. Shortly after an asteroid is discovered, its impact probability and its impact time can be calculated to hour level accuracy even if the potential impact is tens of years in the future. In addition, the impact location can be constraint to lie within a so called ‘impact corridor’ as shown in this image. 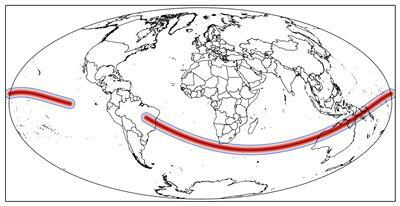 Because of uncertainty in the observations of asteroids, the impact point prediction does not produce a point but a corridor that typically stretches across half the globe. In order to make use of the favourable condition that an asteroid impact is predictable, the asteroid needs to be discovered before it impacts the Earth. Currently, we know of only about 1 per cent of the asteroids that can impact the Earth in the future. This means that the next asteroid impact will likely happen without warning, just like in Chelyabinsk. What is needed now are telescopes that help us discover all potentially threatening asteroids. Space-based telescopes, such as the Sentinel mission proposed by the B612 Foundation or NASA’s proposed NeoCam mission, would be able to discover most of the remaining asteroids within 10 years. The observations of such telescopes would also help reduce uncertainty in the observational data. Less uncertainty means that we can make a clearer statement about whether or not an asteroid hits. Similarly, better observations collapse the impact corridor to smaller width and allow to make better predictions about where a potential impact might occur. The current knowledge of the asteroid impact probability distribution changes over time because new observations improve our knowledge. But information, such as shown in the last figure, can help disaster planning because it is our current best guess of where an asteroid impact might occur. Usually, impact probabilities are low, similar to winning the jackpot in the lottery. This is the daily situation that we live in and not very worrisome. However, some asteroids stand out and in 2004 the asteroid Apophis had a 3 per cent probability to impact in the year 2029. In such a scenario, it is important to know where the impact can occur and what the consequences might be. To support decision making with respect to the asteroid threat, we have developed a software (named ARMOR) that can predict the impact locations of asteroids and their impact effects. The figures shown here are results of this research that have also been presented to an audience of world experts at the Planetary Defense Conference in April 2015. An asteroid impact can be averted by altering the trajectory of an asteroid. Our long-term goal is to support asteroid deflection mission design by including the knowledge of where the asteroid could impact and what damage it could cause into the deflection mission design process. Asteroids are part of our natural environment and smaller specimens collide with the Earth on a regular basis. Typically, a harmless shooting star is the result but a large asteroid impact can cause damage on global scale. Telescopes are the next step to enable further investigation of this natural hazard. Early observations make it possible to predict the impact location and even enable deflection of the asteroid such that no impact occurs. We are not in a critical situation at the moment and the continued effort of the dedicated planetary defence community aims to ensure that we are prepared when the next Tunguska asteroid is discovered.